Nowadays, we hear the word heart attack very often around our neighbors. One of the major causes of sudden death is heart attack, a.k.a. myocardial infarction. The myocardium (heart muscle tissue) supplies blood and it's where the pressure generated by the heart is greatest. The blood vessel that carries blood under pressure from the heart to the rest of the body is called the artery. 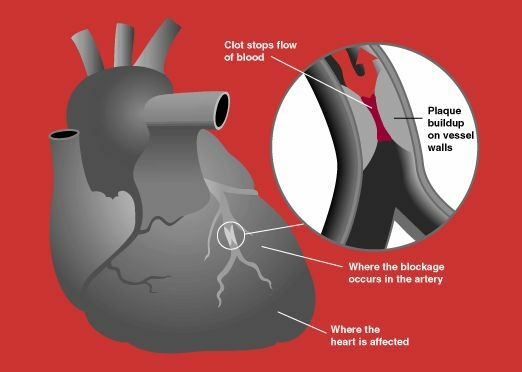 When cholesterol deposits (plaques) form on the inner surfaces of the arteries, it will obstruct the blood flow when the blood clots on the roughened plaques. 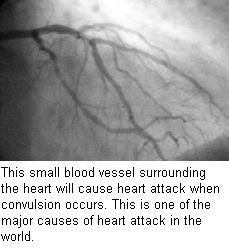 This condition of the artery is called atherosclerosis and myocardial blockage may cause heart attack. In addition, myocardial blockage mortality rate is high and even presently, 10-30% of sufferers have died. When you're suffering from heart problems, it is preferable to perform a Coronary catheterization (crown artery diagnosis) to prevent myocardial blockage from occurring. Possibility of remedy with medicine could be applied in this inspection. The above statements are commonly known and most doctors advise you not to take fatty foods and take more rest to avoid accumulating cholesterol in the blood. However, our medical studies and my new theory add another important fact to the above statements. What is it? 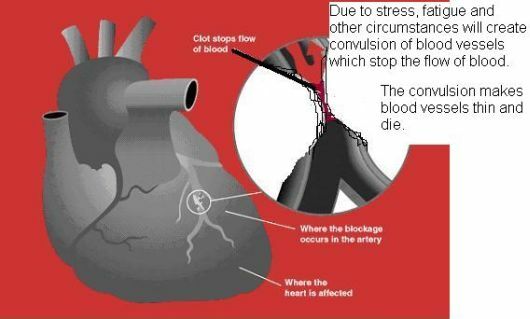 According to our studies, spasm or convulsion along the blood vessels surrounding the heart are often the cause of heart failures due to stress and fatigue. Most patients who experienced this phenomena complained toothache, stomachache, shoulder pain, back pain, stiff neck, and ringing in the ears, rather than anything in the heart. Why do I say this? It's because blood tests done from those patients found that their cholesterol contents were normal. Further studies found that those patients were among white-collar workers rather than blue-collar workers in Japan. Also, have you ever heard a symptom called "Economy Class Syndrome"? It is medically termed Deep Vein Thrombosis (DVT) and I can tell you that most heart problems we encounter were not due to high cholesterol but to this economy class syndrome. It is more dangerous than any other heart attack. Your family doctors tell you to avoid fatty foods and eat more vegetable which has fiber contents to reduce cholesterol and prevent high blood pressure. Because of doctor's advice, entire families were in good condition with low contents of cholesterol in the blood. But suddenly, one collapsed due to heart attack. Another one was also collapsed and unfortunately died. Both of these incidents showed that their cholesterol contents in the blood were normal. What was wrong with them despite efforts following advises of their doctors? This is what we call Economy Class Syndrome. During periods of extended inactivity in cramped conditions such as a long plane flight or even a long car ride, normal blood circulation can be restricted. 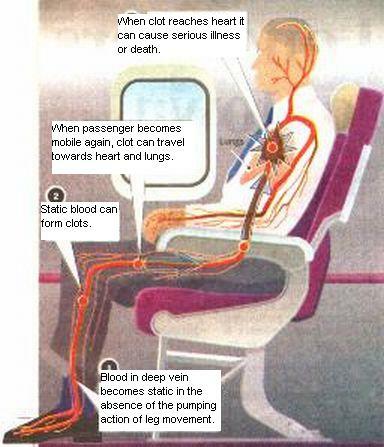 This can cause leg fatigue and discomfort and may contribute to the serious problem of Economy Class Syndrome or DVT. Activity of the calf muscles is needed to contract veins and propel blood from the legs back to the heart. Without this activity, blood can pool in the veins of the leg and form DVT, a blood clot in the legs. The problem may not be obvious until a traveler arrives and begins normal activity. That's when the clot can dislodge and migrate to the lungs where it can cause a pulmonary embolism, a dangerous and often deadly condition. How to avoid or escape from such unfortunate incidents? Adequate hydration (drink considerable amount of water) is necessary. As you have learned during school days, the human body is made up of 60% water. Our body will lost some amounts of water when we stay in the airplane or train for a long period of time. Therefore, blood becomes thick, and may cause blockage. At least half a cup to one cup of water every one hour should be taken diligently as the way of preventing it. Prevent drinking alcohol, even though it's a liquid, it will have an adverse effect since it is diuretic. As a supplement, Vitamin C (500mg or more) is effective for antiblood oxidization. Apart from the above preventive measure, moving or massaging your calves, rotating your ankles, or doing rock scissors paper with your toes, are some simple exercises to release the pressure. Our observations and researches show that economy class syndrome or unknown reason of heart attack are more often happening to white-collar workers than to blue-collar workers. This is very obvious that daily exercise is important for us. From today, you may be free from heart attack. Unfortunately, PYRO-ENERGEN can do nothing for this kind of heart attack. 4. "Heart Disease Risk Increases at Age 40 and on Menopausal Women"